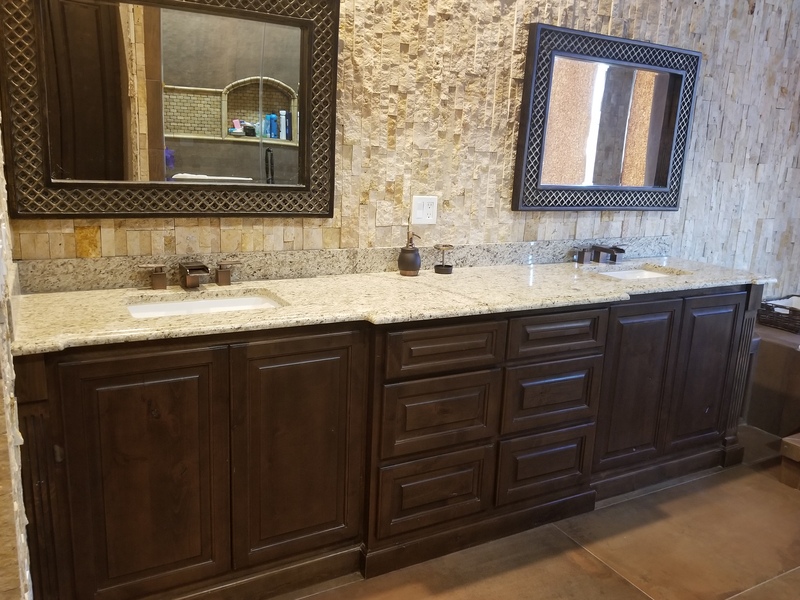 Bathroom Countertops in El Paso | Eleganzza Granite Inc. Bathroom Countertops in El Paso | Eleganzza Granite Inc.
A great way to add a touch of class to your home’s bathrooms is by considering adding new countertops. When deciding on the right material for your bathroom’s countertops, it’s important to understand everything the surface will face on a daily basis. Wet environments are prime real estate for mold, mildew and bacteria to grow and fester. For this reason, granite and marble bathroom countertops are excellent options for homeowners in the Southwest. Deciding on the right material is not as difficult as it may appear at first. With help and guidance from Eleganzza Granite Inc., your bathroom renovation and remodeling needs won’t only be met, they’ll be exceeded! Granite countertops are beautiful and resistant to heat but they also come in large, heavy slabs, making it difficult for homeowners to appropriately accommodate these countertops in their home’s bathrooms. The surface of a granite is porous which means it requires sealing in order to prevent water and any other type of moisture from entering the surface. This is where quartz countertops come into play. Since quartz countertops are man-made instead of being cut from natural earth, countertop contractors are able to create a surface that perfectly accommodates the desired space. Furthermore, quartz is non-porous which completely halts any type of moisture or water to build up on or below the surface. This makes quartz one of the best material options for bathroom countertops. Both quartz and granite are long-lasting and highly resistant but quartz is more resilient to chips and cracks. Granite, on the other hand, is able to take on higher temperatures. Deciding on the right material all depends on the wants and needs of the household. One thing remains true, however, both granite and quartz countertops are as beautiful as they are resilient. As far as home renovations go, bathroom countertop replacement yields one of the greatest returns on investment. Not only are new counters beautiful and resistant, they also add value to your home. Since granite and quartz last so long, you won’t have to pay for repairs or replacements as often as you would with other materials. 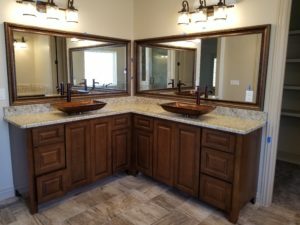 Granite may require regular sealing services from time to time but that is the full extent of the maintenance requirements to keep your new bathroom countertops looking great. If quartz or granite don’t suit your fancy, don’t fret. 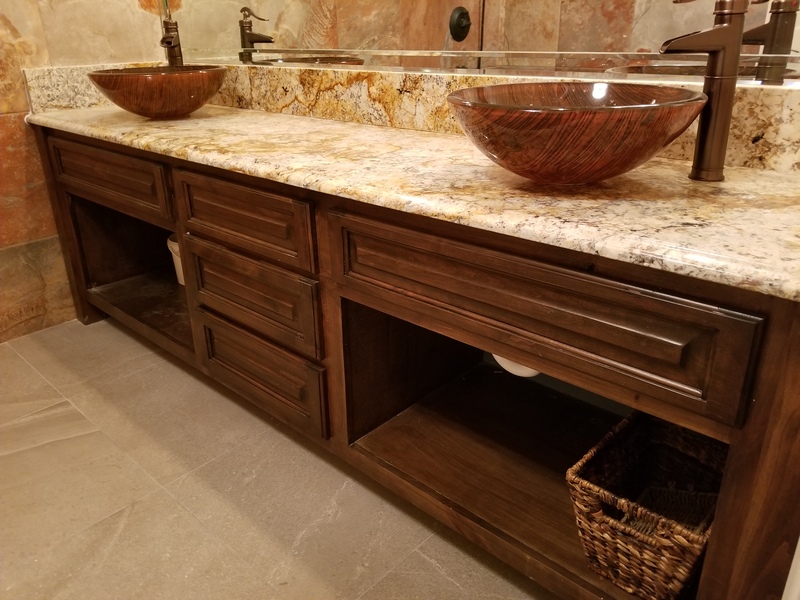 As El Paso’s leading countertop contractor, Eleganzza Granite Inc. is able to provide many different types of material, from granite and quartz to onyx and marble. We also offer remodeling services to take your bathroom to the next level. No matter what you need, you can rest easy knowing Eleganzza Granite Co. can provide it. If you would like to get started installing new quartz or granite countertops, we offer quality customer service at Eleganzza Granite Inc.
We actually carry a wide range of materials in our inventory. Contact us today for more info! One of our experts will be happy to answer your questions or set you up with an appointment to collect measurements and start on a quote.